I didn’t know they could read. He doesn’t have to read to get nasty about someone putting a sign on HIS shore. “Heh, heh, heh. This should keep those diseased riddled, littering, annoying humans outta my yard! My office is on the south shore of Lake Eola in downtown Orlando. 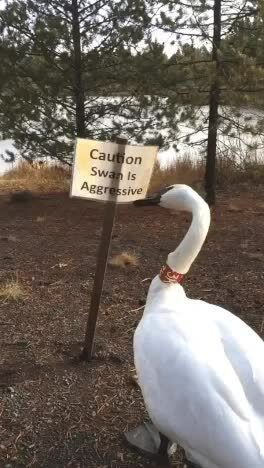 We’re always getting news of something the swans have done. Of course I’m aggressive! Remember all the crap I took as the Ugly Duckling? !